Trying to speak like a British person is harder than I thought. I figured coming to London would be a safe bet, language-wise. As I think I’ve stated before, all things being equal, I probably would have preferred to live in Paris over London, but the ease of getting a Visa for the United Kingdom married with the fact that I DO speak English and DON’T speak French made London seem like the logical choice. After all, they speak the same language as me, right? Sometimes the accents are really hard to understand, and I’ve already mentioned that Brits seem to have a tendency to clip the last sounds off words, in the words of the Polish bartender I was speaking with, “swallowing their words." Beyond that, though, I’ve had to learn a whole new vocabulary since I’ve arrived here. In North America, I lived in an apartment with an elevator. In my parking garage was my car, with an engine under the hood and a snow scrapper in the trunk. When the trash can was full, I’d take out the trash. I used to take the subway to work. Now, I live in a flat. Unlike my place in Toronto, it has no lift, so I have to walk up the stairs. Cars here have boots for luggage and bonnets cover the engine. When I am done with something, I bin my rubbish, before heading off to work on the tube. Things that used to be singular in North America are plural here. Kids in North America learn math, here they learn maths. Conversely, here in London people eat five servings a day of fruit and veg, as opposed to the 5 servings of fruits and vegetables they eat in North America. Truthfully, it felt a little weird at the beginning, calling my apartment a “flat,” my trash “rubbish,” asking people to open their trunks by calling them a “boot” and catching the “tube” instead of the subway. After a while, though, I got used to it. Repeat something enough, and it starts to become second nature. Plus, most of my new vocabulary was just that, NEW vocabulary. They were words that had no particular relevance to the words they were replacing. The words may have had other meanings, for example in North America I used lift as a verb, now I use it as a noun as well, or flat was an adjective used to describe pancakes, now it is as used to describe the box I live in. One switch I have really struggled with, though. 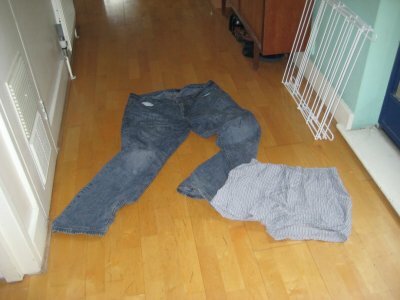 Which one are the pants? If you said the denims, you are probably one of my North American friends. If you pointed to the boxer shorts and said, “those are the pants,” then you are from over this side of the pond. I have not been able to make the switch to calling my underwear my pants, and my long, leg related clothing as jeans or trousers. For my North American friends, the translation as the Brits would hear those phrases.